As you might guess, when thinking of the Crater at Petersburg, a subject which crosses my mind is the use of artillery in the operation. Not to diminish the other aspects of the battle, but the artillery of the Army of the Potomac played an important role there… and is somewhat overlooked in my opinion. I’m not an expert in the battle. So I would direct you to one of many folks who have written book length treatments of the battle. For those who are squinting, the roll call is eighteen 4-½-inch rifles, two 20-pdr Parrotts, fifty-two 3-inch rifles (3-inch Ordnance or 10-pdr Parrotts), thirty-eight 12-pdr Napoleons, ten 10-inch mortars, sixteen 8-inch mortars, and twenty-eight Coehorn mortars. Grand total is 164 guns and mortars brought to bear on the Confederate lines in support of the assault. Some of that number were in the 18th Corps sector and not firing directly in support of the assault. Others were, likewise, firing on the 5th Corps front well to the south of the crater. But all were firing at some time that morning to suppress or pin down the Confederates in conjunction with the assault. For comparison, the “great bombardment” by the Confederates on July 3, 1863 during that “contest” at Gettysburg involved about 140 guns. Hunt’s map indicates not only the battery positions, but also what the targets were. This adds to the “clutter” on the map. But this is an incredible resource for determining his intent with respect to the fires placed upon the Confederate lines. The snip above looks at the area of the mine, and just south. 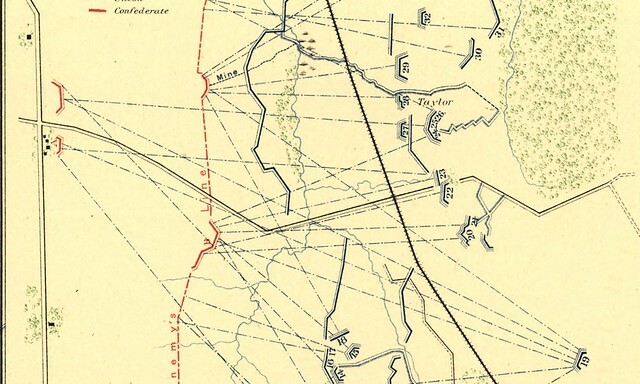 Notice there are more dashed blue lines leading to the Confederate redoubt south of the mine than there are the redoubt above the mine. Suppression of the Confederate line was the intent there. Another Federal position worth noting is that of Company C, 1st Connecticut Heavy Artillery. Battery number 8 on Hunt’s map contained ten 10-inch mortars. Circled here in blue. 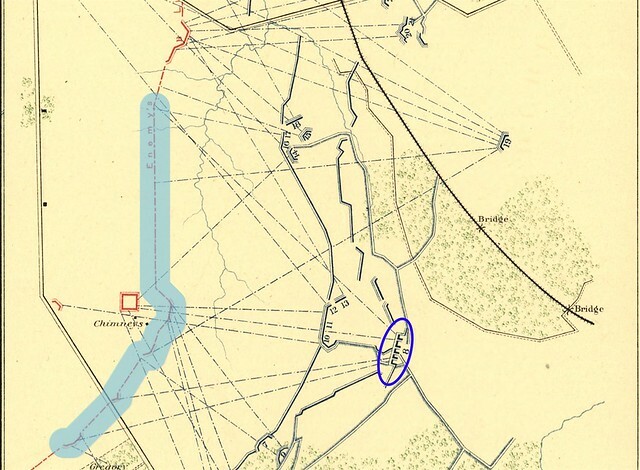 Those mortars fired on approximately 1,000 yards of the Confederate front, to the south of the crater (blue shading in the snip above). Recall, these mortars were firing, for at least part of the day, case shot as constructed under Colonel Henry Abbot’s instructions. Battery Number 19, Company B, 1st Connecticut, with six 4-½-inch rifles, located north-east (center-right on the snip above) of the mortars also covered a large section of the Confederate lines. One problem with these arrangements is that suppressing fire requires a high rate of ammunition expenditure. 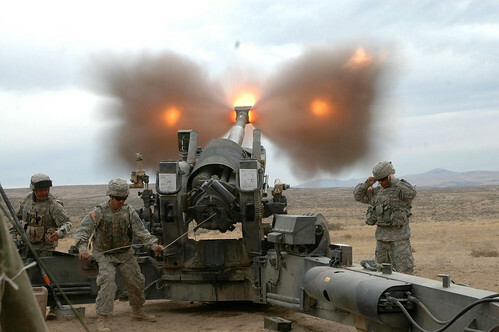 Suppressing fire cannot be sustained, even by a master artillery chief such as Hunt, for longer than a few hours. At some point, fresh ammunition chests must be rotated in. The assault had to quickly achieve the initial objectives, or lose the suppressing fire support. Napoleons (and siege howitzers) as mortars: More data and range tables! Back in May I wrote about a “suggestion” from Brigadier-General Henry Hunt in regard to firing 12-pdr Light Field Guns – Napoleons – as mortars. Hunt inquired with Colonel Henry L. Abbot, 1st Connecticut Heavy Artillery and the presumptive commander of the siege artillery to support the Army of the Potomac, about testing Napoleons dug in to fire at high angle. In that post, I remarked that Abbot “… had not gotten around to trials of the Napoleons as mortars. Nor would he.” A few days after the request, Abbot moved to Fort Monroe to join the Army of the James. Well, I have a correction to make! Commenter John Wells offered “a vague recollection of reading in some period artillery manual or other that the Napoleon could be reversed on its carriage to allow high angle of fire “mortar practice”” At the time, I didn’t recall such, but noted there was mention of siege howitzers employed in that manner. But John’s comment, coming from someone knowledgeable on Civil War era weapons, had me double checking. Sure enough, a passage from Abbot laid out those experiments with some detail. John was spot on! 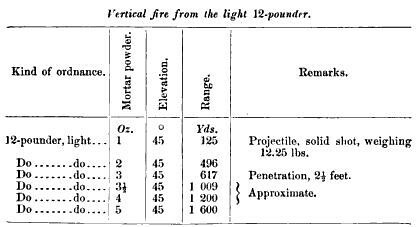 The advantages of vertical fire under certain circumstances are so great, that in May, 1864, a few experiments were made, under my direction, by Captain [Wilbur F.] Osborne, 1st Connecticut artillery, to test the light 12-pounder gun as a mortar. They indicated that it might be thus used when mortars could not be procured; but the expedient was never necessary in the siege of Richmond. The carriage was dismounted and the gun reversed in its trunnion beds so as to point over the trail. Two parallel skids laid in a direction perpendicular to the parapet and separated by the proper interval, supported the axle at such a height as to allow the breech to be depressed between them sufficiently to give an angle of elevation of 45º to the piece. The breech rested on a kind of quoin, and it was found necessary to tie the trail down with the prolonge when the gun was fired. With five ounces of powder, giving a range of about 1600 yards, the strain upon the carriage was inappreciable. Solid shot (weighing 12.12 pounds) were used; and with charges of four ounces and less, the sabot was not detached until striking the ground. With very small charges the sabot passed below the vent, but the friction primer always ignited the powder. These experiments were made in grate haste, at the request of General Hunt, chief of artillery, army of the Potomac, only three days before starting for the field, and no very extended trial was practicable. For comparison, the standard Napoleon load for a solid shot in horizontal fire was 2.5 pounds, giving 1,680 yards at 5º elevation. So almost the same range, with a lot less powder. But that’s mortar powder instead of the standard grade cannon powder, mind you. The ranges cited were for solid shot. Using shell, I would think the ranges would, as they did for horizontal fire, drop off to around 1,300 yards. And shells were more practical for vertical fire. The practical issue with the arrangement used in the tests was the modification of the weapon mounting. Dismounting a 1,225 pound bronze gun was no trivial matter in the field. And for the field artillerists, who would need to employ the gun in most cases for direct, horizontal, fire, this would mean two periods of time in which the gun was unavailable for use. Not to mention the need to bring along wood for rails, as tested by Osborne. Similar experiments with an 8-inch howitzer were conducted by Lieutenant Colonel [Joseph A.] Haskin, in charge of the defenses north of the Potomac, in October, 1863. The following are the results obtained by him and communicated in the manner above described. The variation in range between the two models, of which the bores differ only in the form of the chamber, (elliptical and gomer,) will be noticed with surprise. It accords with my own experiments, soon to be given, with the new and old model mortars. The absolute value of the range shows that a considerable economy in powder wold result from using the howitzer instead of the mortar, but in service this advantage would be more than balanced by the greater inconvenience of loading and pointing. It is, however, a fact worth remembering that vertical fire, in cases of necessity, can be obtained readily and effectively from guns and howitzers.